How can we make dairy sustainable? I live in an urban community, and my assessment is that most urban people think we do have too many cows. When I ask what alternatives they recommend, the responses are typically naïve. A typical response seems to be that we should be developing more plant-based industries, but there is seldom any understanding of the climatic, soil, topographic and market limitations thereof. We do have some outstanding horticultural success stories, with kiwifruit, wine and pip fruit being standouts. Hopefully, these and some others can continue to grow, but all face constraints relating to very specific soil and climate requirements. The ‘big three’ plant-based industries have succeeded because they have focused on consumer markets as the starting point for industry development. Through a range of strategies and product positioning, aligned with specific bio-physical resources, they have created a competitive advantage. It has been a way of thinking with which the pastoral industries still struggle. If dairy is to prosper then it has to have a social licence to operate. That licence includes both environmental and animal welfare components. Each needs to be addressed separately, but both then come together into overall farming systems. The current level of debate around environmental sustainability is woeful. Most people are firmly in one or other tribal camp. The leaders of the tribes shout out messages across the void. Those messages resonate with their followers but seldom move the debate forward as the other side hears the noise but not the message. A starting point with dairy environmental sustainability is to recognise that there are at least four important measures. These are bacteria levels in water (with E coli as a key indicator), phosphorus runoff, sedimentation, and nitrogen leaching. The dairy industry has made huge progress with the first three of these but not the fourth. The ongoing successes with the first three need to be acknowledged by the wider community. The key stumbling block to future dairy environmental sustainability is nitrogen leaching. There has to be increasing recognition, which scientists understand but the industry has not yet come to terms with, that the fundamental problem is the concentration of nitrogen in the cow urine patch. During much of the year, this concentration of urine is not a big concern, as plants take up the nitrogen without major leaching. But urine deposited in the second half of autumn is not taken up by plants before winter leaching occurs. And nitrogen added in winter itself largely goes down through the soil and into underground water, only to emerge again downstream. The only solution is to recognise that cows need to be off-paddock during the second half of autumn and throughout much of winter. Anything else is tinkering. Cows can still graze in the paddocks for a few hours per day, but the ruminating and resting need to occur in an environment where the urine can be collected and spread back to the fields in the following spring and summer. Aligned to this, the cow must have somewhere soft to lie off-paddock. Also, although cows do not mind the cold, they do not like lying in the wet. So there has to be a roof. For many farmers, the above statements will be like the supposed red rag to a bull. It looks like a lot more cost, and where are the extra returns going to come from? My own conclusions are that there are economic solutions. However, I do accept that in a heavily indebted industry, where the debt has been structured around assumptions of ongoing capital gain, that many farmers lack the headroom for capital investments. This is where Government will need to come in with concessionary finance for sustainability investment, funded perhaps at their own cost of borrowing. If farmers and the Government cannot work through these issues, then dairy farming will indeed not recover its social licence. And that is in no-one’s interests. I am becoming increasingly confident that dairy composting barns can provide a key pathway to pastoral dairy sustainability. Although increasingly common overseas, I have so far only found one farm in New Zealand where the principles are understood and applied successfully. I think there are likely to be up to three more operating successfully, but I have yet to visit them. There is no great secret to it, but it is a different way of thinking. 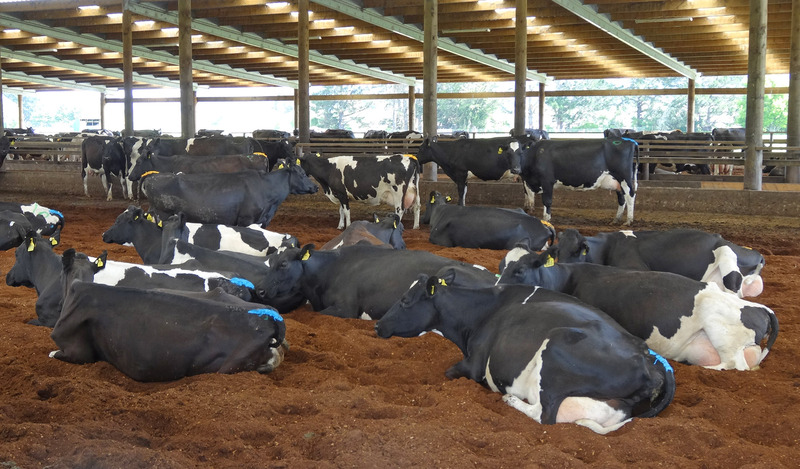 The key elements of dairy composting are a moderately high-pitched roof (at least 18 degrees), plus roof venting, at least 600 mm of suitable bedding material, appropriate stocking for the specific environment, and twice daily tilling. Water troughs should be outside the composting area but feed troughs should be inside. The compost should last for 12 months in the shed and must stay warm and dry. Break the fundamental rules and it will not work. The key benefits of a composting barn, apart from preventing nitrogen leaching, are better feed utilisation, less damage to pastures, less winter feed required, and considerably higher per head production. The sheds can also provide summer shade. The cows love this system. With any new system there will be some challenges. Aspects of what Americans and Europeans do with their composting systems will need to be tweaked for New Zealand conditions and there will be variations within different New Zealand environments. So that is where we need an R&D program to monitor and customise the system for New Zealand conditions. This is something I am currently trying to facilitate. 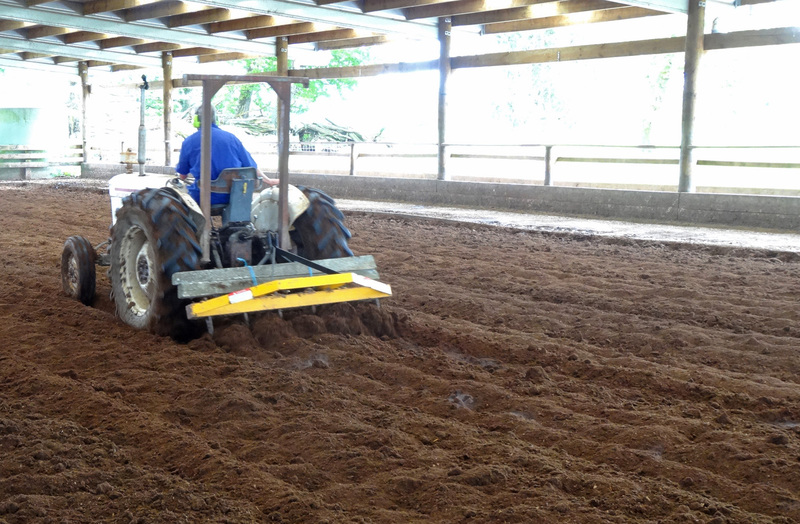 Bedding materials and fine tuning of compost management are key ‘work-ons’. Composting barns are not the only solution and free-stall barns also have their proponents, particularly in the South Island. But for our hybrid New Zealand grazing systems, the compost barns will have lower capital cost while providing superior cow comfort and cleanliness. One of the challenges for dairying is that as soon as one issue is addressed, the anti-dairy warriors find other reasons why we should get rid of dairying. Greenhouse gases (from cows doing what comes naturally to them) is one such issue. And there is also supposedly a looming threat from synthetic milk. Both greenhouse gas issues and synthetic milk are big issues which are indeed too big to deal with here. They are topics for another day. Suffice to say I don’t think either issue needs to destroy the dairy industry. There are strategies to deal with both. In contrast, our dairy industry is genuinely threatened by its failure to get on with the long conversion process required to produce A2 milk that is free of A1 beta-casein. Many of the big farmers with multiple herds are actively converting, but the small farmers, with poorer information sources, are at risk of being blindsided. They have not and will not see the tsunami coming. I have written about that many times, and will do so again. A key bottom line of relevance to all New Zealanders is that our agricultural resources favour pastoral farming. It is not by accident that animal farming lies at the heart of New Zealand agriculture, and that agriculture lies at the heart of the New Zealand export economy. There are no easy alternatives. Those who hope for the demise of dairy should think carefully. In contrast, for most plant-based industries and also for manufacturing industries, and as a small isolated country in the South Pacific, we lack global competitive advantage. So, we do need to keep a focus, but not our only focus, on pastoral farming. But that does not mean that we can prosper by doing things the way we have been doing for the last thirty or so years. As Bob Dylan once wrote and sang, ‘the times they are a-changin’. 23 Responses to How can we make dairy sustainable? Interesting post, but what do you see the economic basis being for this proposed intervention? This is where Government will need to come in with concessionary finance for sustainability investment, funded perhaps at their own cost of borrowing. The financial rationale is that the average dairy farmer does not have the headroom to borrow from banks (who are increasingly averse to further dairy-farm lending with many of their clients). The economic rationale is that we cannot afford to destroy the dairy industry which is crucial to the export economy if we also wish to deal with poverty. And in any case, the economics will be good (although this will indeed need to be demonstrated). The banks would grudgingly come to the party and wear the transaction costs (because the alternative of destroying the dairy industrry will give them huge losses). For their existing clients, the additional transaction costs are actually very small. And the Government (and hence socety) would have very minor costs because the Government would be on-lending via the banks at the Government borrowing rate. But will it happen? Possibly not, because ideology may get in the way. Incidentally, I can find many other aspects of the economy where there are considerable government subsidies in the name of innovation and export enhancement. Would it be feasible to turn the effluent and waste by products from the feedlot system into biogas/diesel? It is a one off expense, if the farm produced enough effluent or was organised in a co-op system it could digest and produce fuel for for the local farmers, take care of the effluent issues or leaching at the same time. This should be a solution raised to the government. The digested material could then be spread back onto the farms for fertilizer. This is a proven system in other parts of the world. Yes, this is technically feasible, and is being trialled at commercial level on some New Zealand farms (currently in the construction phase). In my opinion, the economics remain very challenging. My own preference therefore is for in situ barn composting and periodic transporting back to the pastures. But it is good to continue exploring diverse and alternative solutions. I can just imagine the ”hue and cry” from urban New Zealand when the dreaded S worded is suggested Keith..I well remember the 1980`s and how it was seared into New Zealander`s psyche that the root of all evil was subsidizing farmers!..including helping to finance compost barns as you suggest. I think it could be ‘sold’ to urbanites as an animal welfare issue. Requiring farmers to provide adequate shade in summer and shelter in winter to minimise suffering by cows. I think a combined carrot and stick approach will prove to be necessary. Farmers must realise that they are going to need a lot more fixed capital. Privately owned single family farms are no longer viable in today’s world. Denmark is a nice example why government funded loans can cause massive issues​. Cheap money leaves farms lazy and rotten. Interesting that you don’t mention looking at reducing high nitrogen in the urine by providing a more natural diet of diverse permanent pastures containing herbs, which would have the added benefit of building a more resilient, healthy soil that didn’t need the artificial nitrogen (which presumably is far more of a problem than urine). Yes, the cows might produce less milk but they would be healthier and it would be better nutritionally. The consumer could pay a little more for it to cover the decreased yield. The problem is actually the nitrogn in the urine rather than in the fertiliser. It is true that pasture is particulary high in nitrogen, and that balancing that pasture with other feeds, including but not only some herbs (also PKE and grain for example) will lower the N levels in the urine. Herbs do not have the ability to fix nitrogen so there is still a need for legumes (such as clover) or fertilser N or a combination thereof. Plaintain is currently seen as the most promising plant to add to NZ pastures but there are issues of how best to manage it in the sward. It could become a useful tool in managing leaching but it will not provide an overall solution by itself. I am with Christine, I think the dairy industry is too heavily focused on production at all cost. I don’t think New Zealand should be relying on the dairy industry to pull it out from poverty. In fact I think the dairy industry has created poverty by destroying rural communities through importation of cheap labour. Also, the fact that the production is focused on producing milk powder for an inherently lactose-intolerant nation is something of a moral issue – particularly when you are producing baby-formula, from a country that advocates 90% breastfeeding in its own population. The only people getting rich off the backs of dairy farmers are banks. Maybe the N levels are so high in the urine because of the years of historic urea abuse. There are so many issues wrong with the production system, NZ soils are some of the most abused I have ever seen and the animal welfare standards are some of the lowest I have experienced. Valuable contribution as ever Keith. Thank you. The only solution is to recognise that cows need to be off-paddock during the second half of autumn and throughput much of winter. Anything else is tinkering. do you believe this to be true for all soil types, and pastures? I’m thinking deeper rooted pasture species, and less fractured soils. Also, I wonder if rivers and streams are free flowing, and regularly flushed by rain events, is nitrogen a really damaging issue? I understand total transit time of water in our (non-dammed) rivers and streams is just a few days. It will be true for any soils where winter rainfall exceeds soil moisture holding capacity, and where water therefore penetrates below the root zone. There won’t be too many dairy soils in NZ which escape these conditions. Yes, writng more about milk intolerances is somewhere on the ‘to do’ list. Interesting article and while I think composting barns are definitely worth more investigation, I also suspect that on many dairy farms a lot could be gained by reducing cow numbers (and urine patches somewhat and need for N fertiliser) and feeding those that remain better, which would likely reduce marginal costs and improve profitablity. Some gains can be made in regard to N leaching by reducing stock numbers, but it won’t be enough to solve the leaching problem. And reducing stocking rates will not by thelselves lead to increased milk production per head on many farms. Apart from a few very favoured locations such as the Lincoln University Dairy Farm, higher production requires supplementary feeding in the shoulder seasons. Now, in many situations that is a good economic strategy, but it does not align with the views of ‘no supplementary feeding’ brigade. La veo como solución para la lecheria de mi país lo que usted propone. En mi país tenemos una variación de clima muy acentuado. Estamos pensando en aplicar este sistema en vacas de 1/3 de la lactancia y también en las vacas pre parto. También hace dos años que estamos usando toros A2A2. Pienso como usted que bienen cambios muy importante en la lecheria. El tema como podemos adaptarnos. Thank you for the article. As a previous farm consultant and now Rural Adviser with Horizons Regional Council I am very interested in ‘covered loafing/stand-off pads’ which I think is a more useful label. Has there been any in-depth comprehensive cost/benefit analysis of this sort of off-paddock infrastructure? Ian, the quick answer is ‘no’and the long answer is that I am working on it. But at the moment it is a ‘labour of love’ until we can get something more formal organised. I think it is important that we distinguish between those roofed structures that are composting and those that are not composting. Hopefully some of the environmental councils might choose to contribute to the R&D monitoring, as it has potential to be transformational. Hi Keith, I am curious to learn more about your views regarding the following statement: “Both greenhouse gas issues and synthetic milk are big issues which are indeed too big to deal with here. They are topics for another day. Suffice to say I don’t think either issue needs to destroy the dairy industry. There are strategies to deal with both.” What strategies are you thinking of? Would these have nitrogen leaching co-benefits? Why should we not have a multi-faceted conversation about water, climate, and synthetics all at the same time? Well yes, we can as a society have such a conversation. But the conversation needs to be based on evidence, and trying to deal with all of those aspects in one article is more than a little challenging. I have previously written at this site about some aspects of water (and I will have more to say in future). And I have also touched on synthetic food both here and in a recent radio debate. Once again, I may have more to say about that in future. I have also been studying climate issues in some depth for many years, but I have left others to carry that debate. The exception with climate is that I have had something to say about the challenges of meeting our Paris commitments. And I may have something further to say in future about that as well, particularly about using a single index to measure both short and long lived gases. None of those complex issues can be served by just a few sentences. Excellent article – I wonder if the cost could be partially, if not mostly, offset by putting solar panels on the roofs of those barns and turning them, in effect, into mini power stations, and that perhaps co-investing by a power company/trust might help with the capital investment? I understand that Germany has had a lot of success with this, albeit with a lot of government support.